Spikes in training and competition workloads, especially in undertrained athletes, increase injury risk.1 However, just as attributing athletic injuries to single risk factors is an oversimplification of the injury process,2 3 interpreting this workload-injury relationship should not be done in isolation. Instead, we must further unpack how (ie, through which mechanisms) workload spikes might result in injury, and what characteristics make athletes more robust or more susceptible to injury at any given workload. In other words, which factors mediate the workload-injury relationship, and which moderate the relationship. Like dominoes being knocked over, mediators can be viewed as the intermediary steps that explain the association between an observed variable and an outcome.4 In this context, mediating variables help to explain ‘why changes in workloads might cause injuries?’ For example, it is known that rugby league players exposed to spikes in running workloads, indicated by a high acute:chronic workload ratio, are at an increased risk for non-contact injuries.5 One potential explanation is that neuromuscular fatigue mediates this relationship, such that increased workloads cause higher levels of neuromuscular fatigue, subsequently precipitating injury (eg, while performing a cutting manoeuvre) (figure 1). 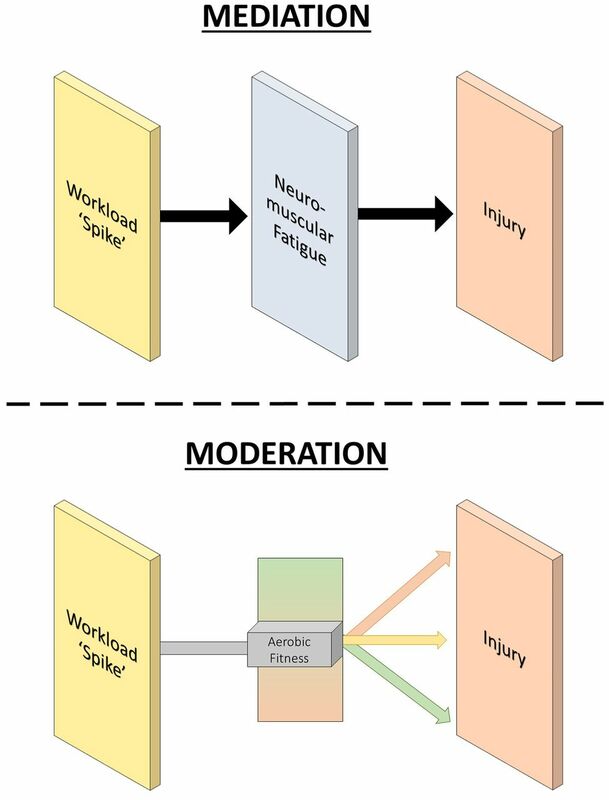 Examples of how mediating and moderating variables explain the association between a workload spike and subsequent injury. Top, neuromuscular fatigue is shown as a mediator (ie, domino) of the effect of workload spikes on injury. In this example, a spike in workload causes an increase in neuromuscular fatigue, and an increase in neuromuscular fatigue leads to an injury. Bottom, aerobic fitness acts as a moderator (ie, dimmer switch) of the relationship between workload spikes and injury. In this case, a given spike in workload will elicit a different injury risk dependent on an individual’s fitness level. On the other hand, moderators can be viewed as ‘dimmer switches’, modifying the effect of a given variable on an outcome. They are also referred to as interactions, or effect modifiers.6 In our context, moderator variables answer the question: ‘what characteristics make certain athletes more robust or more susceptible to injury at given workloads’? For example, in Gaelic football, high aerobic fitness protects against workload spikes.7 In other words, aerobic fitness protectively moderates the workload effect by ‘dimming’ or reducing the risk of rapid workload increases (figure 1). What rewards await at the finish line after jumping the hurdles? Improved understanding, better prevention—Mediation and moderation, as well as their more complicated cases, will improve our understanding of causal mechanisms behind injuries, and subsequent preventative strategies. Moderating variables that are modifiable are key intervention points to ‘dim’ the risk associated with training and competition workloads. Addressing insufficiencies—The inability of screening single risk factors to predict future injuries has been understandably challenged.8 However, shifting our conceptualisation of these variables from injury predictors to variables that moderate the load-injury relationship provides a different motivation for screening and addressing any shortcomings. For example, while aerobic fitness may not predict injuries, it may increase athletes’ resilience to higher workloads. Therefore, when athletes perform poorly on preseason fitness tests, practitioners may choose to lower the allowable workload ‘threshold’ for this athlete, while providing individualised attention to address the deficiency. Training smarter and harder—Ultimately, attaining high chronic training loads without rapid spikes in the process is considered current best practice.1 However, understanding the characteristics that make certain athletes more robust may allow for more nuanced training load prescriptions. For athletes with a collection of characteristics that ‘dim’ workload-related injury risks (eg, high aerobic fitness, no previous injuries), practitioners may consider prescribing higher training workloads (eg, an acute:chronic workload ratio of 1.7) for performance purposes, given that their associated risk is lower than that of the average athlete.
. Understanding and using mediators and moderators. Soc Indic Res 2008;87:367–92. Meeuwisse WHMD. Athletic injury etiology: distinguishing between interaction and confounding. [Editorial]. J Sport Med 1994;4:171–5. Competing interests None to be declared.